Where can my videos be shared? * While a secured embed code will not work within a program directly on your computer, some programs can export a file for use within a secured UNSW website. SCORM authoring programs are a good example of this, a secured embed code may not work within the program, but will work once the SCORM package has been uploaded into UNSW Moodle. theBox service can also share audio, documents and images. However these are not processed by theBox service for web-streaming and there is a higher requirement for the users computer to be setup appropriately. It is typically more common to upload these files to the website directly. A typical webpage is made up of user content formatted with HTML instructions that simply tells the web browser how to display the user content. For example, a simple website may use HTML to control the font and size of a paragraph, or the height and width of an image. An embed code essentially consists of a web link to a video, with HTML iframe code that tells the web browser how to display the video within the webpage. Many programs can also accept HTML code, though they typically are less functional or more restricted in how they do so than web browsers. Staff can enable embed codes for their videos, which can be used to display a video within a webpage or program. It is also possible to manually edit the HTML of an embed code to alter the display of the embedded video, eg. changing the size of the video in the page. theBox service currently supports HTML 4 standard embed codes to maintain compatibility with users on software/devices currently incompatible with HTML 5. This is expected to change in the future as more people use HTML 5 compatible devices/software. When should I use a secured or public embed code? Secured - These embed codes be used on white-listed UNSW websites only. Secured embed codes cannot be copied and re-used elsewhere, which is important when content is subject to sharing limitations. Public - These embed codes can be used on any website or program that supports HTML 4 iframes. Public embed codes can be copied by viewers and used elsewhere. The secured embed link should be used whenever video content should be restricted to staff/student users due to copyright or other limitations, and these links should be embedded within a white-listed UNSW website. In contrast, public embed links should be used when security is not a concern, but sharing flexibility is. You can embed a video in a website by generating a public embed code within theBox and pasting the resulting embed code into your website's HTML editor. You can also paste the embed code into a particular program if it supports HTML iframes. Click the Edit Video link. In the drop-down menu, select Public (with embed code). 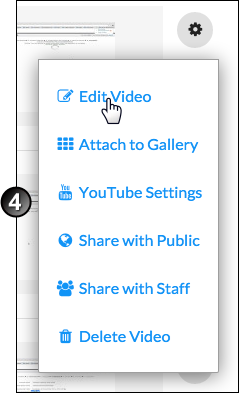 Change the optional extra settings that became visible when you clicked on the Embed tab as required. Click the embed code. It will highlight and you can copy it. Paste the embed code into your website editor. You can embed a video in a UNSW whitelisted website (such as UNSW Moodle) by generating a secured embed code within theBox and pasting the resulting embed code into your websites HTML editor. Note: Some programs can accept the secured embed code, but will not be able to display the video within the program. This is expected behaviour and can be still useful for programs that ultimately create content for a white-listed website, for example a SCORM authoring program may create a SCORM package that is later uploaded into UNSW Moodle. Click Scroll down to Secured Embed Code , and click Enable. Click Save to apply the changes. An embed code will now appear on the bottom right of the page. Click on the embed code. 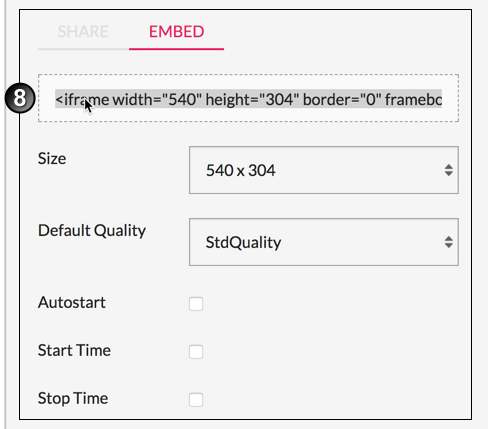 Paste the embed code into your website editor and save changes. As embedding a group of multiple videos on one webpage can extend the page length and page loading time, it is recommended that a sub-page is created that hosts the videos. 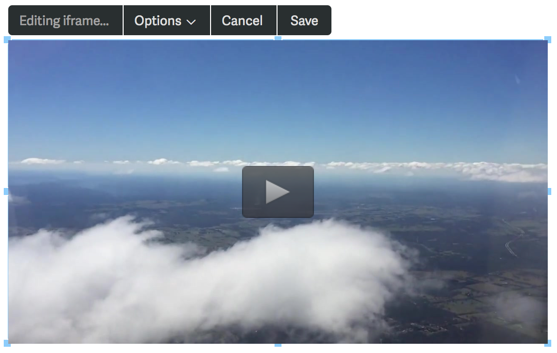 Create a new blank page on your website for the group of videos. In a separate window, log in to theBox using your zID and zPass. Navigate to the first video you wish to share. Scroll down to the Restrict access to dropdown and select Public. If you want the video to automatically start playing click the Autostart checkbox. In the first window where you created a new page on your website paste the embed code into your website editor. Repeat steps 3-11 for each video. While at first glance a video's embed code (copied from theBox) can look quite complicated, it can be easily edited to change the video's dimensions within a webpage. As you can see in the prior example, there are two sets of identical numbers within the embed code. 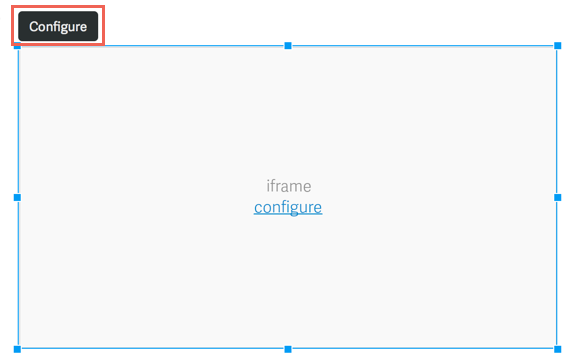 There are two sets of values as the width and height values control the height and width of the iframe in pixels, and the h and w values control the size of the video within the iframe in pixels. These match by default and we recommend that you maintain this for most scenarios. Adjusting the final video size is just a matter of changing the desired numbers within the embed code, and then using the edited embed code instead. How can I have a UNSW website white-listed? To allow the use of secured embed links on a UNSW website, please contact the IT Service Centre on x51333 or itservicecentre@unsw.edu.au with a request to whitelist a website, the website URL and the justification for the white-listing. While the TELT team does not actively investigate the ability of different software packages or services to support embed codes (which are industry standard HTML iframes), we can provide tips on the following. Microsoft Powerpoint does not support the use of video embed codes from services other than Youtube. For more information please visit this support page. theBox videos can be embedded within SCORM packages created by iSpring, just be aware that secured embed links will only display within the SCORM once it has been uploaded to UNSW Moodle. <iframe width="540" height="304" border="0" frameborder="0" allowfullscreen style="border:0 none;" src="
In your Smart Sparrow lesson, select the Components Tab followed by Blank Component. Enter your embed code in the Source block, located in the Selection tab. Once entered, whilst in the Selection Tab adjust the position and dimensions of your content. X & Y: Changes the video player's position within your Smart Sparrow screen. 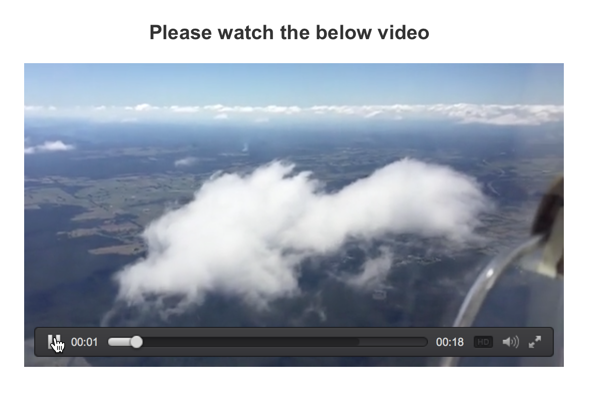 Width and Height: Changes the dimensions of your video player. Once satisfied, click Configure to see a preview of your content. Note: As a public non-UNSW website, Smart Sparrow is not white-listed for secured embed code use at this time. Our understanding is the latest versions of these software packages require HTML 5 iframes, so theBox embed codes currently do not work.